Diagnostic messages are either errors ( ) or warnings ( ) which indicate that there is a problem with the proposal. All diagnostics should be resolved prior to submission. If a given diagnostic cannot be resolved (e.g. it is not clear what to do), please contact your Program Coordinator (HST Phase II), hsthelp.stsci.edu (HST Phase I), or jwsthelp.stsci.edu (JWST). For a demonstration using specific examples, see the training movie. In the Form Editor, put the cursor on the or the to display a tool-tip with a short summary of the problem. In the Tree Editor, put the cursor on the or to display a tool-tip with a short summary of the diagnostic. Note that the Tree Editor displays containers, so it may be necessary to open a container to get the tool-tip on the diagnostic. Besides syntax errors, problems encounter while running the Orbit and Visit Planners are also indicated; these appear in the Tree editor on the Visit. To obtain more details on errors and warnings, use the Diagnostics Browser. 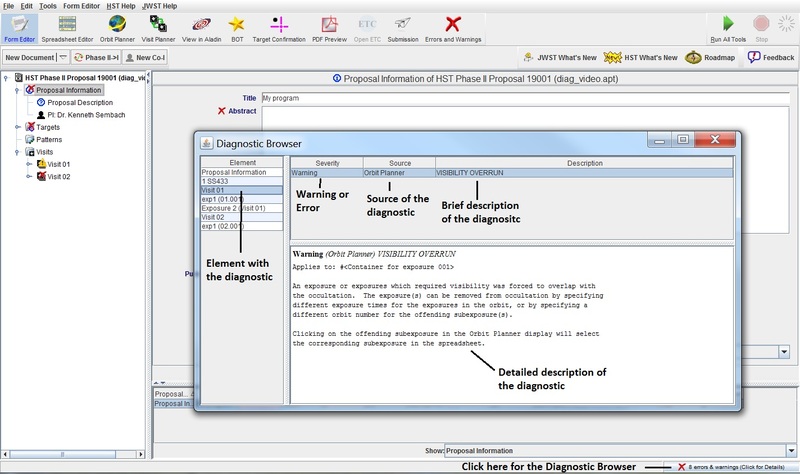 Note that the browser shows diagnostics for the entire proposal (not just a particular visit), and if multiple proposals are loaded, the diagnostics for ALL proposals will appear. The Element column indicates where the diagnostic is occuring (e.g. 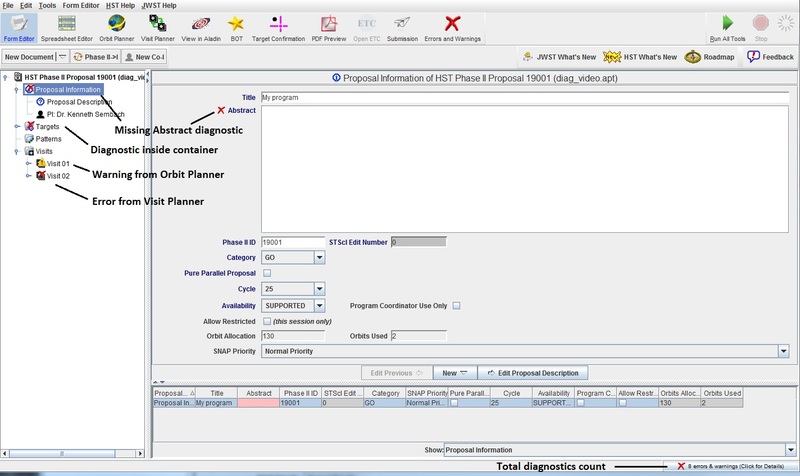 target, exposure, visit), the Severity column indicates if the diagnostic is a warning or an error, the Source column indicates the source (Form Editor, Orbit Planner, Visit Planner) of the diagnostic, and the Description gives the one sentence summary as in the tool-tip. For a full explanation, see the lower box. To obtain information on a diagnostic, click on the element in the Element column. This will result in the remaining fields being populated. Note that if there are multiple diagnostics in a given Element, selecting that Element shows the complete set of diagnostics. 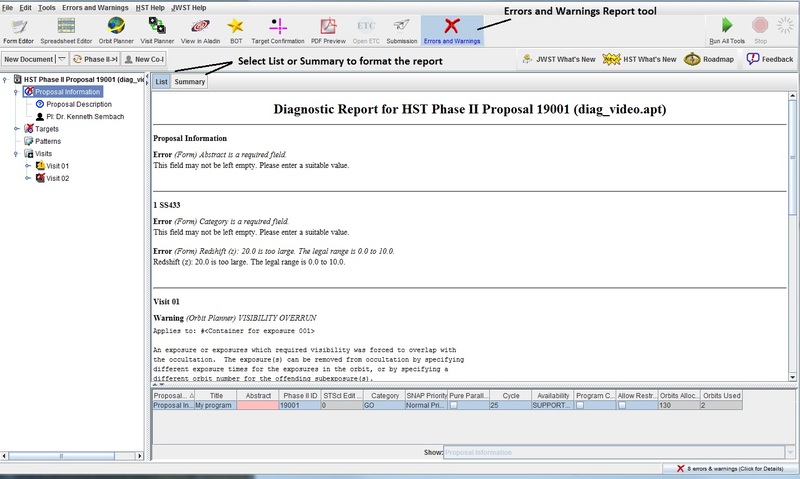 To obtain a complete view of all the diagnostics, use the Errors and Warnings Report tool in the main tool-bar. If List is selected, the items appear sorted by object (e.g. all the target SS433 errors together). If Summary is selected, the items will be sorted type of diagnostics (e.g. all the Visibility Overruns together). Note that items in this tool can be copied (highlight the text and use the ctrl-key appropriate to your operating system) and pasted into another buffer to facilitate sending the diagnostic to your Program Coordinator. Alternatively if you would like a hard copy you can select "Print" from the "File" menu while you are in this tool. Note that APT is an interactive system, and is doing error checking on each update made. This means, for example, that if a new exposure is added, diagnostic flags immediately appear indicating those items that need to filled in. As items are selected (e.g. config), APT becomes aware that other items (e.g. mode) are required, so new diagnostics are generated. Last modified: March 21, 2018.